Whirligigs are wind-driven spinning mechanisms devised historically by sailors and farmers. See the Wikipedia Whirligig page: HERE. These Whirligigs are hand carved in Java from teak. After arriving in Seattle, they are adjusted to ensure excellent operating condition. When installed outside in a garden the paint will eventually wear away, but the Whirligig will last for many years because of the natural weather resistant properties of teak. There are three different options for mounting the Whirligigs, shown HERE. 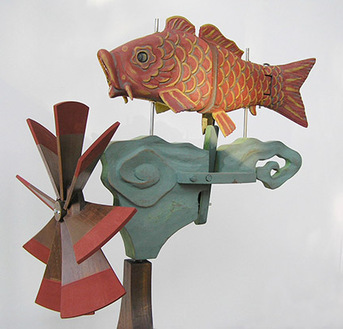 The Fish with its base measures: 17" long x 17" tall, the propellor is 15" in diameter. 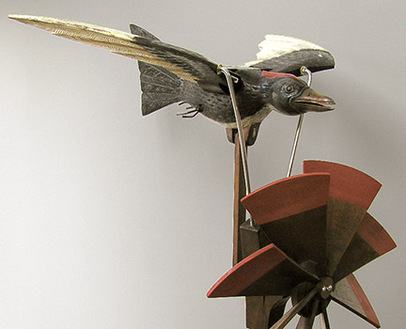 The Bird turns into the wind and the propellor operates an arm that pulls the Bird's body up & down to flap its wings. The Bird with its base measures 17" wide x 17" deep x 17" high, the propellor is 15" in diameter.